Lionel has been providing fun and joy for countless kids for quite some time now. Their toy train production are usually inspired from different worldly icon and one of the most in demand train in the Lionel train model products is the Lionel Disney train boxcar. It is both fun and attractive for most children as well as a good train item to collect for adult train lovers. Some of these trains are limited edition or has stopped their production which makes it a viable collectible train item. The thing about trains bring back memories of our childhood. These memories are usually good and worth remembering. It is a foundation of what we are today, a memory or experience that inspired and motivated us to do something great in life. Something that helped in the development of our mind and enhanced our skills when we were young and we would want to share that with our kids today. This is something that Lionel train model represents. We want them to experience the same goodness that we had, built the foundation of their childhood and hope that they can be inspired as well. 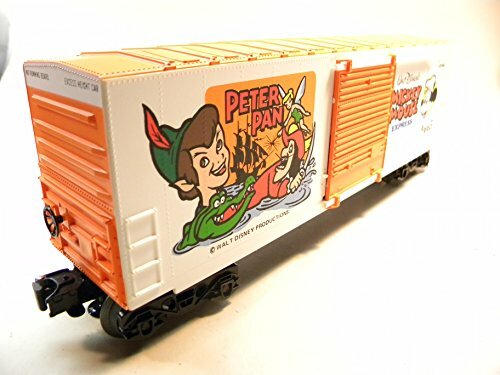 This Lionel Disney boxcar is a wonderful combination of the love of trains and the love of Disney Icon, Winnie the Pooh. This boxcar works perfect for most Lionel Disney train set. It has an opening door on and a length of about 10.5 inches long. 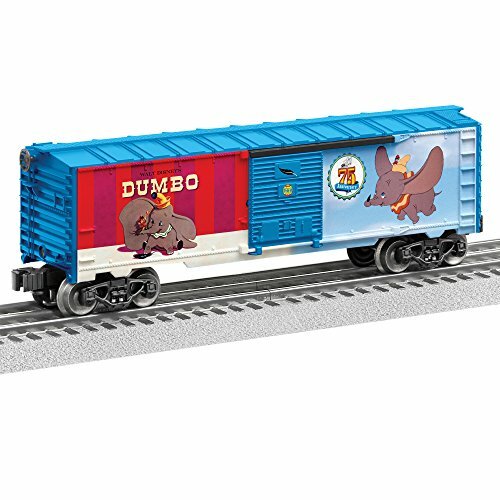 The Lionel world of Disney train set offers this amazing boxcar of one of the many amazing Disney Characters – Dumbo, that celebrates its 75th anniversary. It is made of die cast metal and imported materials. It can fit most Lionel train products. The length is about 10 inches long. It has great detail that features the flying elephant, Dumbo. This is highly compatible with most Lionel train products. It is an iconic Mickey Mouse O-gauge boxcar. It is made with strong metal wheels and durable axles. It has an opening door on one side, perfect for imaginative play as though it transports cargo or other materials. It is another great Disney Lionel boxcar. A great combination to satisfy your kids needs for a wonderful play set. This is a Hi-Cube Minnie mouse boxcar with girly color combination of green and purple. The boxcar is fun and exciting as it can connect to most Lionel train products. This is the famous Winnie and Tiger Lionel train boxcar. It can run through with a nice fit on most train tracks and connects very well with other trains. 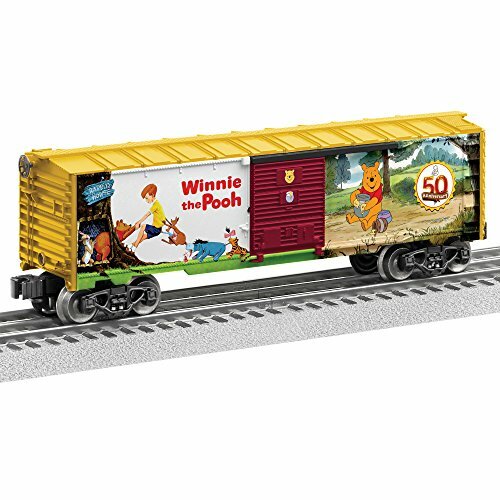 It is a fun boxcar with an opening door that features Winnie the Pooh characters, Winnie and Tiger. The 2 pack boxcar will extend the fun of your Disney Lionel trains to a maximum. It comes in a very fine detail and an elegant color of black. It features two of Disney’s well known villain, Jafar and Maleficent. 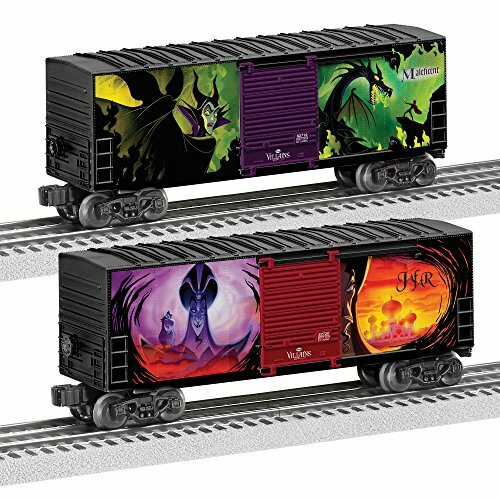 This boxcar can work great during the Halloween to be connected on your Halloween train set. This is a railroad boxcar featuring Disney’s Mickey Mouse. It has an opening door on one side and made of metallic frame. It is a strong and sturdy boxcar that can connect with other trains and can run through most train tracks nicely. The 3-Pack boxcar will come at you as though it is an expensive set of boxcar but it will actually save you some amount. 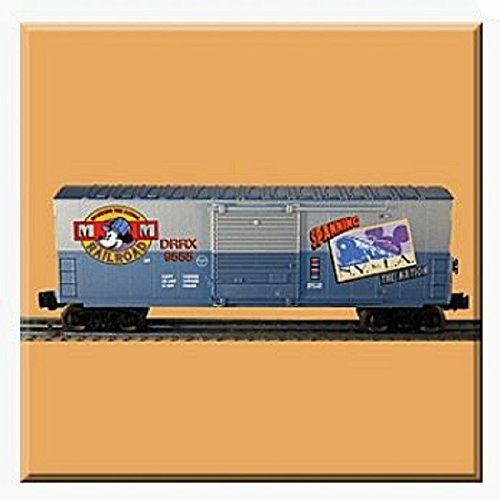 This assorted color boxcar features villains from different Disney cartoon shows and movies. The sprung trucks are made of a die cast metal each with an operating door. This celebrates the 20th anniversary of Disney with the pioneering character printed on one side, Mickey Mouse, showcasing Disney’s Logo. This can fit perfectly to almost all Lionel electric trains made with great construction and reliable durability. This is a little expensive boxcar that features Mickey Mouse. 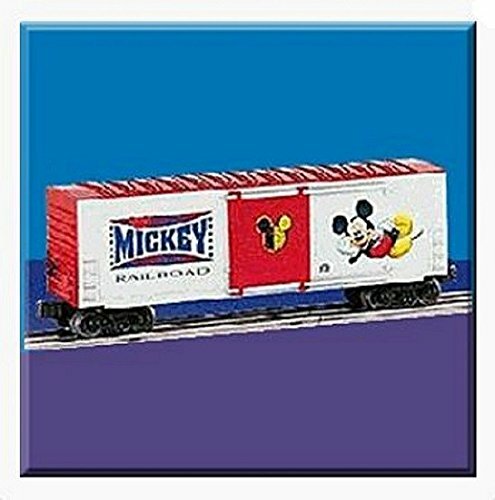 It is a railroad, die-cast metallic boxcar with an opening door, colored red with a Mickey Mouse Logo, on one side. The price varies with the availability of this product as there are only few left being sold in the market. The Perils of Mickey Lionel train boxcar has a plain color of white and purple with designs that shows the danger of Mickey’s adventure. The boxcar includes an opening door in its side with sturdy wheels that can run and fit nicely on your train tracks. This will go nicely with your Lionel Disney caboose, gondola and train. The color of blue and white can look great alongside with other colored train cars. It is durable and could last long to extend your children’s fun. Another great Disney icon is goofy. This train features a sleeping goofy design on the left part of one side and shows what he’s dreaming about on the other. It uses a plain color of blue and white, a color that is highly compatible when it comes to the over-all outlook of any train. It is also a strong and durable boxcar. 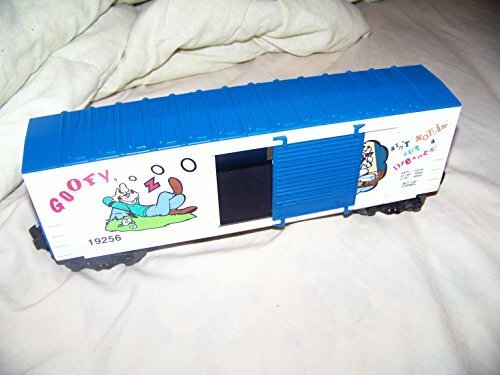 The goofy fandom continues with this amazing boxcar. This metallic die cast boxcar still features goofy in its sides design. A plain color of blue and white makes it compatible with any color train cars. It can also connect to most Lionel train sets as well as run thoroughly without having any problem through the tracks. This is the Disney Lionel fantasia boxcar. It features the magical works of Mickey Mouse. It has an opening blue door on one side and is made of durable metal. It can fit and connect to any Lionel trains which make it perfect to extend the joy and fun of your children’s train ride. 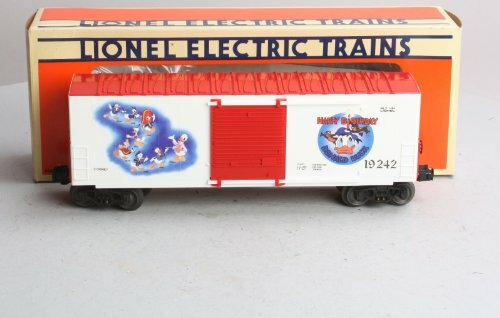 This die cast metallic framed boxcar features Disney’s Donald Duck together with Mickey Mouse and Friends. It is Hi-Cube type boxcar that is an amazing fit with all your electric Lionel train sets. It is durable and made with great sturdy construction. This box car can last for quite some time to provide long hours of train fun. The Disney Lionel have tons of productions you can add to your collection. 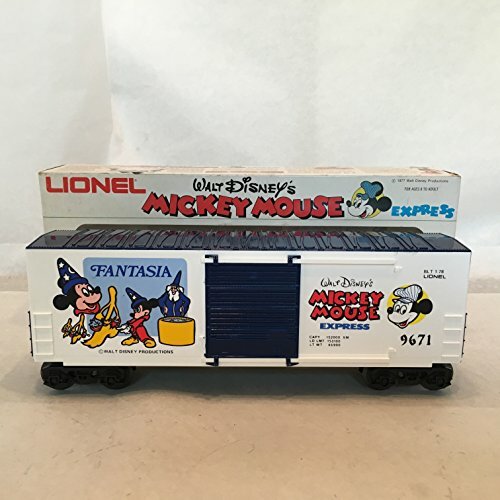 This boxcar is one of elegant looking Mickey Mouse Boxcar is a Hi-Cube type that can be connected to the back of your train engine car to extend the joy. It has metal wheels and axles having a tire with great traction to run smoothly along the tracks. 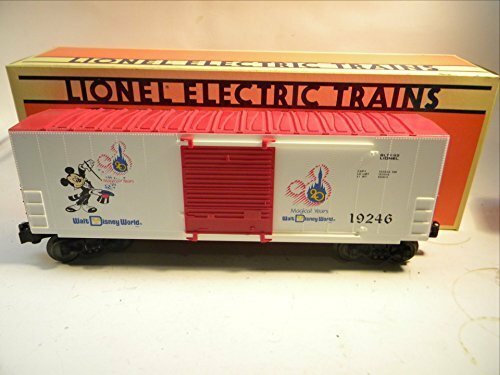 There are only a few of this Lionel Disney train boxcar left in the market. This is a must-have boxcar that is perfect to be connected with the rest of your train cars and train engine. It has an opening door on the side with metal wheels and durable axles to keep the fun going over a long period of time. 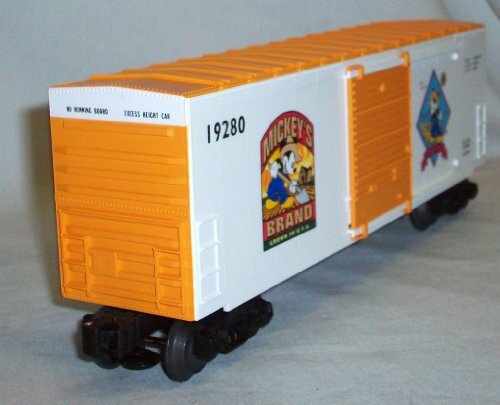 This is an elegant looking Lionel Disney boxcar that features Winnie the Pooh. The aesthetics of this boxcar is not like with most Disney Boxcar. It is painted with a bright color yellow made from thick metallic materials with durability far greater than the other boxcar set. 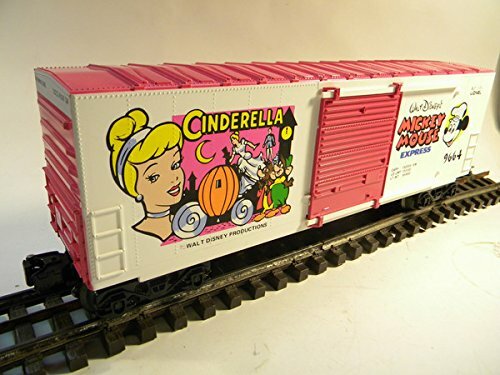 Lionel Disney’s Cinderella boxcar is wonderful for those lady train lovers who owns a set and wants to extend their train and carry more cargo. It is painted with cute pink and white color with a picture of Cinderella in the left side and Mickey Mouse on the other. Although a little bit girly, it still is made from top of the line metal materials and a durable wheels and axles. Only a few of this boxcar is left roaming around the market. This celebrates the 50th birthday of Donald Duck. It is a Hi-Cube, O-gauge boxcar with great aesthetics and design. It is also sturdy and has stable wheels where it can move freely without derailing off the train tracks. This is the last on the list and still is a best fitted boxcar for all Disney Lionel trains. The stocks of this boxcar is low and you must not wait for it to be totally out as it can be very hard to look for if you are planning on collecting this amazing boxcar. It features Winnie the Pooh and Tiger. The boxcar is painted with purple and has a Mickey Mouse Logo painted over its opening doors on the side.